Eight-month-old Clover snacks while her mom, Tracy Briggs of West Tisbury, gathers. Their hands were stained red, their backs a little sore, but the smell of strawberries, as though you had stuck your head straight into a strawberry pie, washed over them. 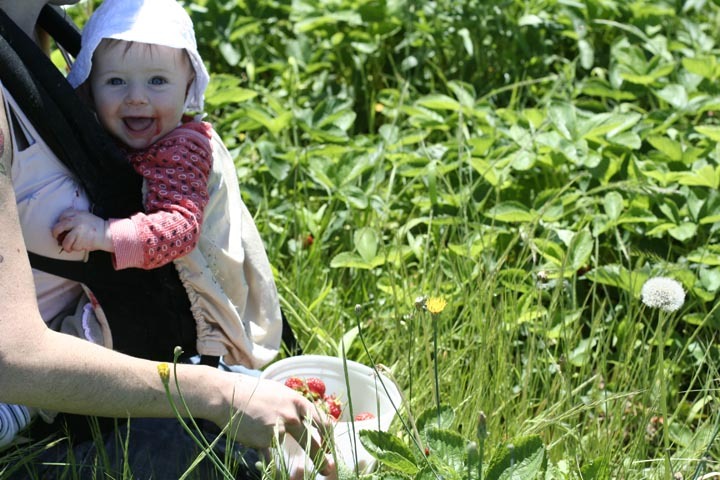 Community Supported Agriculture members at Whippoorwill Farm in OakBluffs last week could be found bent over in the field with buckets full of strawberries, popping one into their mouths every so often. But after a sudden frost a few weeks ago, the strawberry patch at Whippoorwill Farm is open to CSA members only this year; there will be no public “U-Pick.” Full-share CSA members can pick their own berries on Tuesdays and Fridays, as long as the strawberries last. 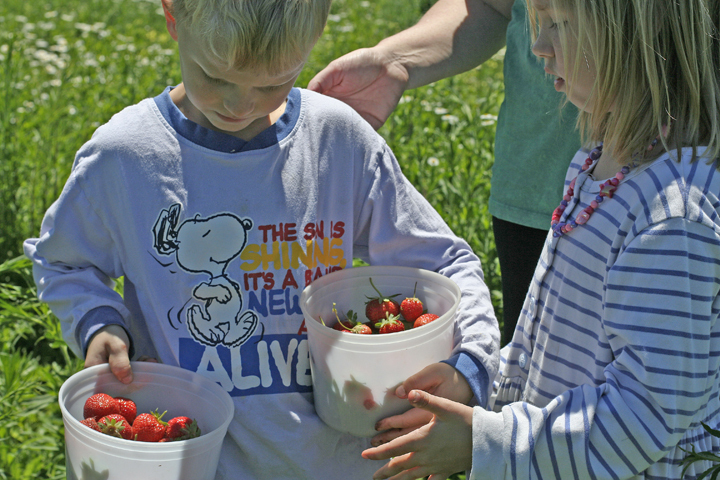 But no matter the weather, strawberry season on Martha’s Vineyard is almost a rite of passage for summer. 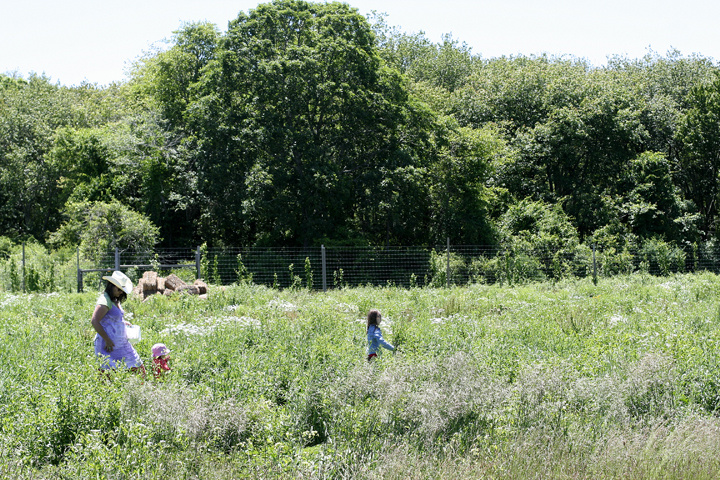 With four acres of strawberries this season, Morning Glory Farm in Edgartown harvested 180 pounds in just one day. Morning Glory began picking the first week of June and has picked every day since then. They’ve even posted help wanted ads in local newspapers specifically for strawberry pickers — fast strawberry pickers that is. “It looks good,” Debbie Athearn said in an interview last week of the harvest so far. After the first round of picking, farmers were tormented with a string of rainy days that could foul future yields. Last year’s wet spring and early summer was described by many as a total bust when it came to the strawberry harvest. Morning Glory only picked 3,500 pounds last year, but hopes to get 10,000 pounds this year. Ten thousand pounds may seem like a lot of strawberries, but Morning Glory is planning on using a large portion of them in the kitchen for baked goods and for a new addition to the farm stand — a juice and smoothie bar. The “morganic” (mostly organic, as Morning Glory is not a certified organic farm) strawberries are preserved in the freezer for batches of jams, pies and now smoothies. Strawberry pie, shortcake and ice cream are traditional American summer recipes, but strawberries were documented more than 2,200 years ago, when ancient Romans such as Cato, Pliny and Ovid referenced the fruit growing wild in the Italian countryside. New England strawberries were first written about in the early 17th century, and the strawberry we know and love today is a cross between an eastern North American variety and a Chilean variety. According to the Merriam-Webster dictionary, the word strawberry comes from Old English streawberige, from streaw (straw) and berige (berry), and it dates to before the 12th century. One theory is that strawberries get their name from the mulching technique, using straw to preserve the fruit, after which people would string berries on a blade of straw and sell in markets. There may be an entire museum dedicated to les fraises in Belgium, Anne Boleyn was thought to be a witch because of the strawberry birthmark on her neck, and there is in fact a North American Strawberry Growers Association, but no matter the trivia of this luscious fruit, to most of us a strawberry marks the beginning of the summer harvest. Mrs. Miller said that her 100-foot row of strawberries survived the mild winter under a row cover just fine. After a frost several weeks ago, there was concern that it would ruin this year’s harvest, but Mrs. Miller said her crop survived the weather once again. North Tabor Farm grows its strawberries organically, and with 20 pounds picked last week, only time will tell how much the farm will get this season. “Whatever it gives us, we’ll be grateful,” Mrs. Miller said. 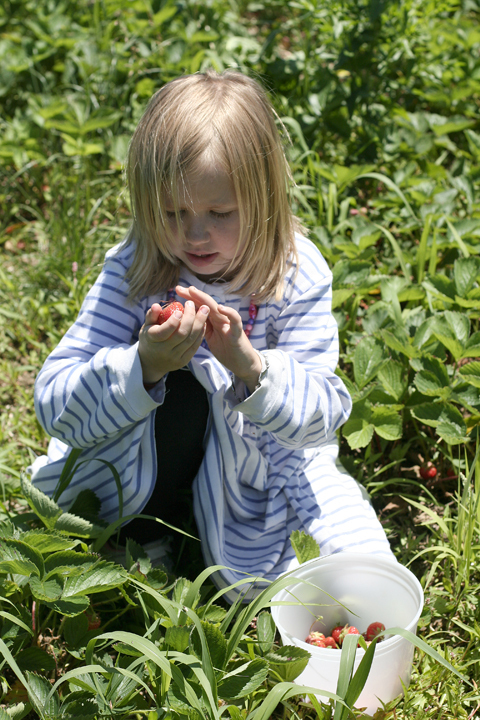 The capstone to the strawberry season is the annual Strawberry Festival, held at the First Congregational Church of West Tisbury on June 19. 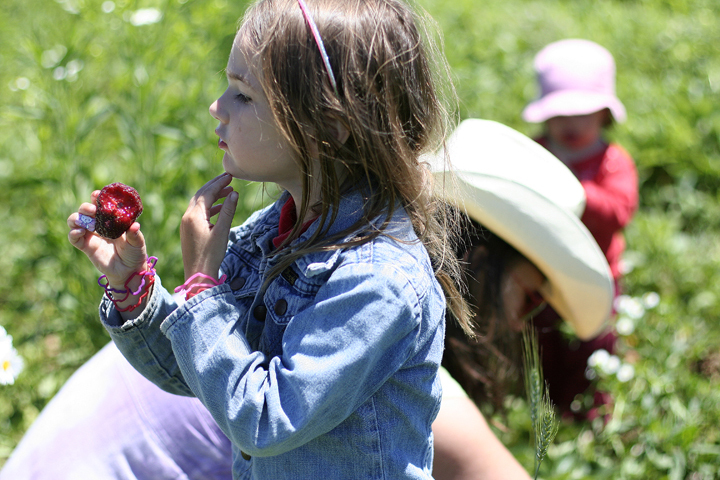 Islanders can start eating their strawberry hearts out at noon on Saturday, and relax on the front lawn with community members. This column is meant to reflect all aspects of agricultural activity and farm life on the Vineyard. To get in touch with Remy Tumin, please call 508-627-4311, extension 116, or e-mail her at rtumin@mvgazette.com.